Translators: Ian Bailey, Leah Hunt. The medieval culinary texts in English prove that in the Middle Ages English gastronomy was at the same level of quality as French gastronomy. This collection, dating from around 1325, includes 63 recipes. It was published in English by Constance B. Hieatt and Sharon Buttler, in Curye on Inglysch (Oxford University Press, 1985). The Anglo-Norman Manuscripts seem to have served as a model for the English book. After the Forme of Cury in the printed edition of 1780, this text includes 112 recipes of meat and 33 recipes of fish or meals for days of abstinence. The recipes of Ancient Cookery are close to these of the Forme of Cury. There is a manuscript of 1381, kept by the Bodleian Library in Oxford, with 92 recipes, beginning with the Latin words : Diversia servicia, tam de carnibus quam de pissibus . This text was published in English by Constance B. Hieatt and Sharon Buttler, in Curye on Inglysch (Oxford University Press, 1985). The Rules of Cookery was written around 1390 by the chefs of King Richard II and published in London in 1780 with recipes dating back to 1381 from Ancient Cookery (Diversa Servicia). Manuscript A, from the British Library, this text printed in 1780 contains 196 recipes. Constance B. Hieatt estimates that this version is unusable because the editors did not know the existence of other manuscripts. Thus, it does not act as a reference point, but the majority of the recipes presented in the Curye on Inglysch can be found there. Complete Text in Medieval language: The Forme of Cury, A Roll Of Ancient English Cookery, Compiled, about A.D. 1390. Manuscript B, from the Pierpont Morgan Library of New York, is very damaged and in the form of a scroll. It includes 180 recipes. Manuscript H, from the British Library Harley 1605, a manuscript comprised of 133 recipes. Manuscript M, from the John Rylands University of Manchester. This manuscript is missing the first few pages but contains 194 recipes. 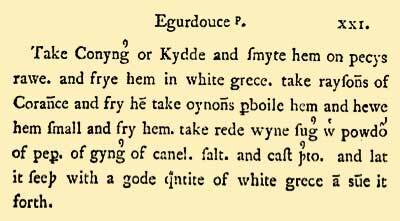 The Forme of Cury in the version of the Curye on Inglysch (Edition Constance Hieatt and Sharon Butler in Oxford University Press London/ New York/ Toronto, 1985) includes 205 recipes. According to Bruno Laurioux, The Forme of Cury never existed in this form because the Canadian historians made a synthesis of the recipes found in various manuscripts. A quarrel among historians perhaps ? The Forme of Cury, Le Viandier de Taillevent and other medieval cookbooks are known in several incomplete manuscripts of different eras. It is often impossible to present the authentic version of origin because of the many alternatives of the texts that exist. For exemple, what we call by convenience The Forme of Cury, is only the text of the Forme of Cury which had been printed in 1780. Same for Le Viandier de Taillevent, which is the manuscript from the BN du Viandier from the 14th century or from another version or a synthetic version (and imaginary) from these texts. We will use the recipe names from the Curye on Inglysch version, while indicating between parentheses, the names of the recipes from 1780 when this appears necessary to us. An introduction announcing a compilation of recipes that were carried out with the agreement and the advice of the masters in medicine and philosophy who resided under King Richard II. This very young king (only 23 years old in 1390), ruled more or less in a despotic sort of way between 1377 and 1399. He died later from hunger in prison. We know his tragic fate thanks to Shakespeare’s piece on Richard II. The Forme of Cury wanted to be better and even more royal than Le Viandier of Taillevent. Was there an existing "patriotic" competition between french and english cuisine? In any case, this confirms the role of political representation at the banquets, a symbol of prestige and power for kings and great medieval lords. As for many cookbooks on medieval cuisine, there does not seem to be very clear plan: the soups and roasted meats or meats in sauces seem to be mixed with recipes for vegetables, (peas, beans, lettuce, leeks...) and recipes for eggs. Some sweetened recipes, (which correspond with our desserts today), are mixed with salted recipes: pynnonade, rosee (rose petals), payn ragoun, (from candy to honey and ginger which can be used to accompany meats and fish), appulmoy, sowpes dorry, fygey, tostee. Then there are some fish and soup recipes for the lighter days (for example, a recipe for pears in wine: peeres in confyt). One also finds recipes for 10 sauces followed by recipes for fritters, pies, tarts, (the sambocade, tart made from elderberries, is classified with salted tarts). The manuscript wraps up with two blancmange recipes, two sweetened tarts recipes and some recipes for ypocras, claret, and a unique beer made with honey. As for the majority of medieval recipes collections, you can find dessert recipes, which were dishes of prestige displaying the power of the lords and majesties: cokagrys (or cotagres in Manuscript A, a rooster on a wild boar, covered with gold and silver foils), chastletes (a wild boar pie in the shape of a castle). one can note the presence of about ten vegetable recipes, in which a very rare recipe for a vinaigrette salad, in the cookbooks for medieval cuisine. The medieval English cuisine seems to identify more with the medieval cuisine of the south than with the French cuisine where vegetables are seldom used. The relationship to southern cuisine is equally evident because of the presence of almonds and almond oil in 19% of the recipes, (compared to 12% from the recipes of the Viandier from the 14th century). This percentage rose to 45% in the books during the 15th century (Harleian). The Forme of Cury also uses large quantities of saffron just as the southern cuisine had, (40% compared to 29% in the Viandier). Its Italian influence is confirmed by several pasta recipes: losyns, rauioles, makerouns, (macrows in Manuscript A), raphioles. The sawse sarzyne, with grenades which does not grow in England, seems to be very similar to the brouet sarrasinois of Anonimo Toscano. One may find many of the recipes to be bitter-sweet, as the Italians like them. One finds also sweetened mustard lombardes as seen in the Italian and Catalan recipes. In addition, 31% of the recipes from The Forme of Cury used sugar, (49% if one adds fruit), compared to 6% from the recipes of the Viandier from the 14th century, (8% if one adds fruit). Some recipes seem to be influenced by the Liber of Coquina, and through him, by the arabic cuisine, like mawmenne for example (mamuniyya Arab): Meat cooked in a sweetened and spiced sauce (stewed). The presence of a confectionary-like payn ragoun, mastered by the arabic technique of cooking in soft ball syrup, confirms the connection between Sicily, (which had been arab, norman and catalan) and England. Sweet-and-sour lamb flavoured with cinnamon and ginger. The Two 15th Century Cookery Books were published in London in 1888 by Thomas Austin, Oxford University Press and are also entitled Harleian (ou Harl) MS.279 and Harl. MS.4016. These 2 texts were published again in London in 1964, Early English Text Society. The 2 cookery books are followed by a selection of texts called Ashmole MS.1439 (19 sauce recipes), Laud MS.553 - Bodleian Library (25 recipes), and Douce MS.55 (12 recipes). Complete text in Medieval language: Two fifteenth-century cookery books: Harleian MS.279 (ab 1430), and Harl. MS.4016 (ab 1450), with extracts from Ashmole MS.1439, Laud MS.553, and Douce MS.55. Here begynnyth dyuerse bake metis: 41 recipes. The manuscript ends with the menus for 13 banquets. Manuscript 4016 starts with the menus for 2 banquets and then proposes 181 recipes. Take wardonys, an caste on a potte, and boyle hem till þey ben tender; þan take hem vp and pare hem, an kytte hem in to pecys (Note: 'in two pieces' ? ); take y-now of powder of canel, a good quantyte, an caste it on red wyne, an draw it þorw a straynour; caste sugre þer-to, an put it in an erþen pot, an let it boyle: an þanne caste þe perys þer-to, an let boyle to-gederys, an whan þey haue boyle a whyle, take pouder of gyngere an caste þerto, an a lytil venegre, an a lytil safron; an loke þat it be poynaunt an dowcet. This collection of 134 recipes is presented in the form of burlesque verse written between 1422 and 1471. This verse was published from the Sloane manuscript Ms 1986 by Richard Morris in 1862. Complete text in Medieval language: Liber cure cocorum, ca. 1430. A Noble Boke of Cookry ffor a Prynce Houssolde or eny other Estalety Houssolde: Printed version of a 15th century manuscript, published in London by Robina Napier in 1882.